This post continues our journey in the depth of Inverse Kinematics. In this tutorial you will learn how to apply this powerful technique to create realistic tentacles. At the end of this post you can find a link to download all the assets and scenes necessary to replicate this tutorial. The previous part of this tutorial, Inverse Kinematics for Robotic Arms, discussed how to use gradient descent to perform inverse kinematics on a robotic arm. The movement performed by machines is rather simple, as they lack the complexity of real human limbs. In a robotic arm, each joint is controller by a motor. In a limb, each muscle is, de-facto, an independent motor that can expand and contract on its own. Several creatures possess limbs are able of several degrees of freedom. Elephants’ trunks, and octopuses’ tentacles are such an example. Modelling those limbs is particularly challenging, as the traditional techniques introduces so far fail to produce realistic results. We will start from the example of the previous post, changing as we go until we obtain a behaviour that is realistic enough for our application. When we built a robotic arm, each part was moving independently. Conversely, tentacles can bend. This is an essential feature that we cannot ignore if we are aiming for realism. Our tentacle will need to bend. Unfortunately, Unity does not provide a way to create skinned mesh renderer from the editor. A 3D modelling software, such as Blender, is needed. The image below shows the model of the tentacle that will be used for the rest of this tutorial. Inside, it is visible a series of bones, one after the other. They are the objects that allows to bend the model. Adding bones to a model, also known as rigging, goes beyond the scope of this tutorial. Blender 3D: Nood to Pro/Bones provides a good introduction to this subject. The next step to allow inverse kinematics on a tentacle, is to attach a RobotJoint script to each bone. 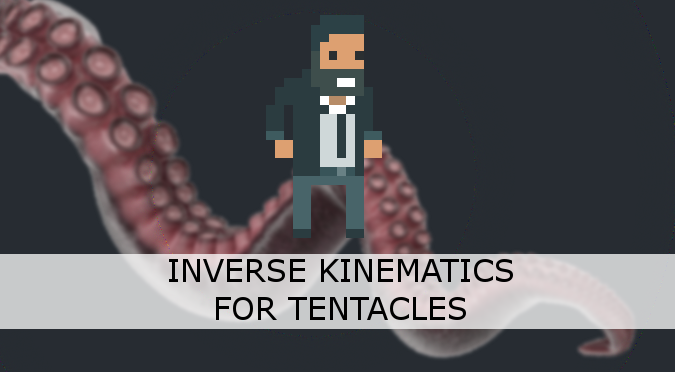 By doing so, we are giving to our inverse kinematics solver the ability to bend the tentacle. In a normal octopus, each “joint” is able to rotate freely along all its three axes. The code designed in Inverse Kinematics for Robotic Arms, unfortunately, only allows joints to move on a single axis. Changing this would mean introducing a new level of complexity to our existing code. Instead, we can cycle the axis on the joints, so that joint 0 rotates on X, joint 1 rotate on Y, joint 2 rotates on Z, and so on. This can lead to unnatural behaviours, but you might never experience any issue if the bones are small enough. In the downloadable Unity project that comes with this tutorial, the script SetRobotJointWeights automatically initialises the parameters for all the joints in the tentacle. 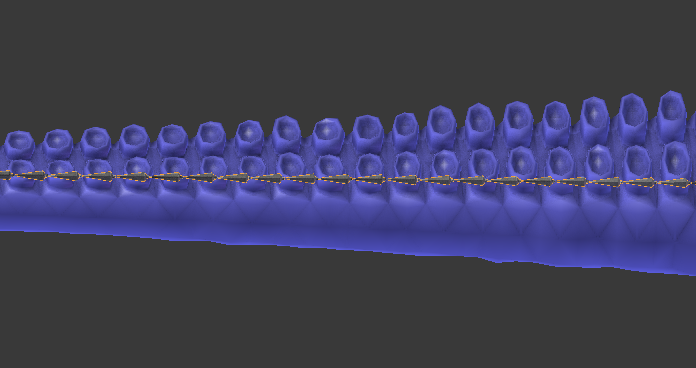 Alternatively, you can do this by hand for a finer control on the way each bone can be moved. The following animation shows two tentacles. The one on the left is reaching for the red sphere using the algorithm presented in Inverse Kinematics for Robotic Arms. The one of the right, instead, adds a completely new twist of realism by spiralling in a more organic fashion. This example should be enough to understand why tentacles do need their own tutorial. Both tentacles relies on gradient descent. The difference is in the error function they are trying to minimise. The robotic tentacle on the left only wants to reach the ball; it does not care about any other parameter. Once the end effector is touching the ball, convergence is reached and the tentacle simply stops moving. Matching the local rotation like this might not always be a good idea. Depending on the situation, you might want to align your tentacle in a different way. Torsion: keeping limbs in unnatural positions is uncomfortable. This parameter penalises convoluted solutions, forcing the inverse kinematics to a more linear, simple rotation.To calculate a penalty for the torsion, we first have to define what “torsion” means in our context. The easiest approach is to define it as the average of the angles for all joints. Such penalty wants the tentacle to be relaxed, punishing solutions that requires lot of twists. These three penalties score leads to tentacles that moves in a rather realistic way. A more sophisticate version could make sure that they keep wobbling even when all the other constraints are fully satisfied. Those three parameters are likely to be expressed in different units. The distance from the target could be metres, while the end effector rotations could be degrees. It’s important to re-scale them according to their importance, so that a difference of 10 degrees is not weighted as badly as being 10 metres apart from the target. This approach also allows a finer control over the behaviour of the tentacle. They can be changed at any time, depending on the situation, to alter the way they move. For instance, you can increase TorsionWeight to untangle messy tentacles. ❓ We don't have an analytical definition! The traditional problem of forward kinematics can be modelled analytically. This means that we can show an equation that solves it. We have mentioned already the existence of analytical methods to solve the dual problem of inverse kinematics. What we have now is a function that, potentially, cannot be described analytically. If we had chosen to use a traditional, analytical approach to solve inverse kinematics, we would be unable to add those nuances to our tentacles. Using gradient descent means that we are now able to minimise (almost!) any arbitrary function, whether or not we have its equation. There is virtually no limit to the number of improvements that one can do. Something that will definitely increase the realism of your tentacles is a slowdown function. Tentacles should go slower when they are closer to their destination target. Also, tentacles should not self intersect. To avoid this, one could use actual colliders on each joint. This, however, can lead to bizarre behaviours. The code ignores collisions, and might still converge to a solution where self collisions occur. A solution is to change the fitness function so that self intersecting solutions are highly penalised. Patreon You can download the Unity project for this tutorial on Patreon. Credits for the 3D model of the robotic arm goes to Petr P.
Credits for the 3D model of the tentacle goes to Daniel Glebinski. A big thanks also goes to Federico Fasce. Sorry, that is not ready yet! Do you have Blender installed? Hi Alan. Have you banned Malaysian’s IP from accessing your site? I’ve been trying for 2 months now and I always get ERR_CONNECTION_TIMED_OUT. Would be nice to be able to visit your site without going through an EU proxy. It seems my provides is blocking several IPs. This is becoming more of an issues for my readers, but I have no direct control over it. When should the Spider Limb tutorial be up? Thanks for these helpful tutorials. Part of that (upcoming) tutorial might be used in a game I’m working on. Kk, thanks and good luck! Still no spider tutorial? These are awesome, can’t wait for the next one! Apologies for the long wait! The code is mostly done, but I still have to finish the article! It’s one of the reasons why I’m writing these tutorials! The tutorial has not been done yet! However, a very similar technique can be read in this other article! It’s quite alright! I can’t wait for when it comes out! thanks for responding :D, also, I wanted to say, thank you for making these tutorials, I haven’t done them yet, but I took a quick glance and they look awesome. Thanks for making them!